Just a quick not to let you know this video now has a timeline underneath it that describes what the elk are saying. With the timeline discussion you can picture what is going on in the herd and surrounding area. There is some confusion out there about chuckling. Chuckling can be directed to bulls or cows. It is more of a contact sound. It is often used by bulls as a signature sound that identifies them. If used up close to a herd with a hot cow, it can bring the herd bull your way to stop the intrusion! 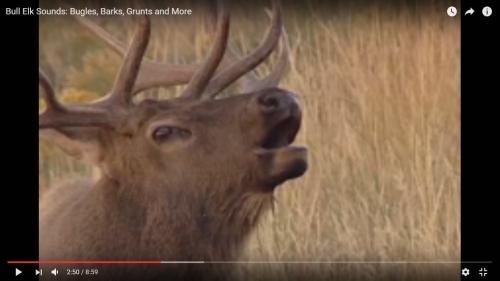 Click on the graphic above to go diectly to the video and learn more about elk vocalization.